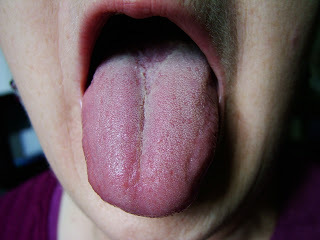 The Stomach crack on the tongue is rather wide and it is in the central section of the tongue (corresponding to Middle Burner). To contrast and compare the Heart and Stomach cracks, the former is rather narrow and runs all along the tongue from near the root to near the tip, while the latter is rather wide and is only in the middle of the tongue. Please see previous posts to see pictures of a Heart crack.A Stomach crack indicates the tendency to Stomach-Yin deficiency. People with such a crack often have no digestive symptoms but I always recommend treating it by using Ren-12, ST-36 and SP-6.